There is a lot to see in Rome, including an infinite number of museums and churches. I however, just visited one. The Musei Capitolini, is walking distance from Foro Romano and actually has a view point behind it that provides an extremely good view of the Colosseum, Palantine Hill and Foro Romano. I spent half a day exploring the magnificent artwork and sculptures on display at this museum. Its definitely worth a visit. There are other sights in Rome that interested me far more than its museums or churches. Those are the fountains, gardens and of course the food. The main places worth visiting for me were Piazza Navona, Fontana di Trevi and of course the place with all the eateries Trastevere. Piazza Navona offers several different things to see. This place has 3 beautiful fountains, a church and a whole of lot of people and pigeons. 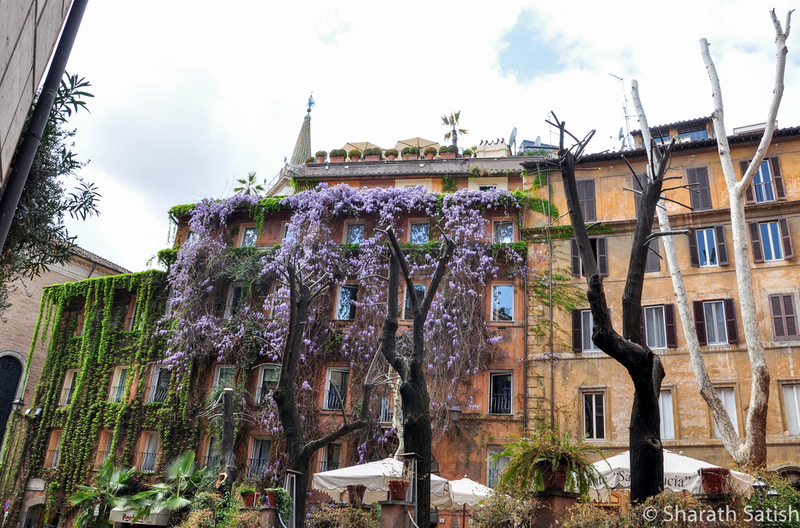 There was also a special building with some beautiful flora growing on its walls on my walk towards Piazza Navona. Fontana di Trevi is always packed with people, but is also big enough that you don't really need to get that close to appreciate its beauty and the artist's skill. You do need to muscle your way through though if you want to drop your wish coin in the fountain :-). If you want to get away from all the hustle and bustle of the city for a quiet afternoon or a picnic lunch, like I did, Villa Borghese Gardens are a wonderful place where you can escape to. The gardens are so vast that you can actually forget you are inside Italy's largest city! I wanted to taste some authentic Italian food and Trastevere came highly recommended, online and from locals, because of the extremely large number of choices for places to eat. We went there almost every night for dinner and even for lunch on a couple of days. We hardly scratched the surface of that area. Always keep a track of where you are, with the narrow streets its easy to lose your way, especially at night where everything looks the same.